We work with homeowners, home restoration builders, co-op and condo associations and commercial property owners to offer waterproofing services for Homes, Brownstones, Apartment buildings, commercial buildings and Lofts in New York City and surrounding communities. All specifications are followed to the standards required for each application by the industry and government regulations. Providing protection against the most destructive force in nature will keep the building structure strong with a healthy atmosphere (dry environments discourage molds and pests). Polyurea is a liquid or spray coating and is used successfully for waterproofing flat roofs, basements, parking garages, flooring and reservoirs/tanks linings (even tanks holding drinking water). A Polyurea application forms a seamless monolithic flexible waterproof coating over building materials which are degraded by basement seepage, sun’s rays on SPF roofs, rain and other climate changes. We have had 3 decades to study their waterproofing performance and Manufacturers have improved their formulations. These coatings are often used routinely in wet environments to repair concrete or steel surfaces. Some formulas will dry within 4 to 6 hours- a big advantage when you need a protected structure back in service. Polyurea is often used for the protective top coating of Spray Foam Roofs and many others- contact us for a free inspection to see if this affordable option is suitable for your buildings roof. Application over a SPF roof, will improve its durability, add to its lifespan, reduce energy bills and seal tight against common leaks around flashings that plague other flat roof systems. The polyurea coating can even withstand constant standing water. 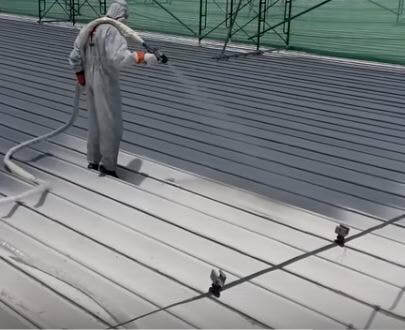 On commercial roofs, the coating will resist corrosive chemical fallout that could be exhausted onto a roof’s surface from manufacturing processes taking place either in the building below or from a neighboring building. The spray can be formulated with non-fading UV colors, such as white which is used to reflect the UV rays back to the atmosphere to avoid heat transfer to the building below. Possibly one of the biggest advantage is: The roof coating does not weigh much so this can be sprayed over many roof substrates, such as metal, wood, stone, concrete, foam and others which eliminates the need for the old roof tear off. The ability to leave on the old roof saves money for the property owner and is also kind to the environment by keeping old roofing material out of the garbage dump- New York already has too much garbage. 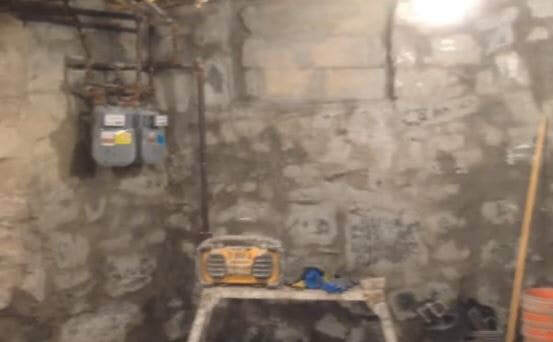 Inspection of Basements or Cellars, for possible Polyurea waterproof treatment, would look for some typical signs of water infiltration through basements or cellar walls. 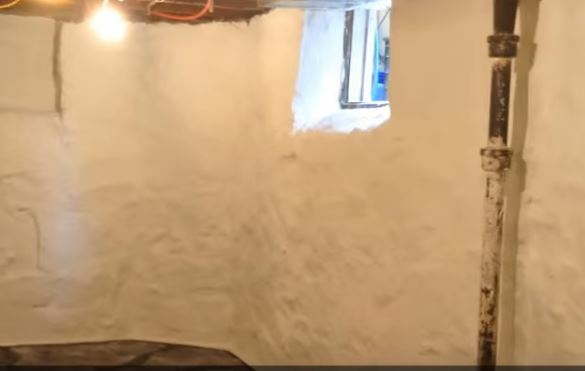 Such as, musty smell, cracks in the walls, basement floor cracks that have some heaving, water seeping in from the seam where the wall meets the floor and the bottom row of concrete blocks could be damp with a white powder on them. This white powder is called efflorescence an alkaline substance composed of salts and minerals that will leach from concrete exposed to near constant moisture. These damp basements also encourage the nearby rodent and insects to take up residence such a warm, dark and damp space. Polyurea waterproofing will remove these positive living conditions for roaches and mice by closing all cracks or holes that let these critters in with ground water. Additives can also be added to make a floor coating slip resistant- a good safety improvement for a basement floor. The spray application assures that the proportions in the compound are accurately mixed so the quality will be uniform throughout the target surface. Waterproofing your basement will enable storage of treasures, books, photographs and extra linen without that ever-present smell of mildew. Most of a home’s atmosphere has a lot to do with what floats up from the basement so if respiratory infections running through the family seem never ending time to request Skyward Roofing come and preform a free waterproofing estimate of your basement or cellar space.